Chunk is now at the age where he enjoys Halloween so I've been looking for arts and craft ideas to entertain him during half term. 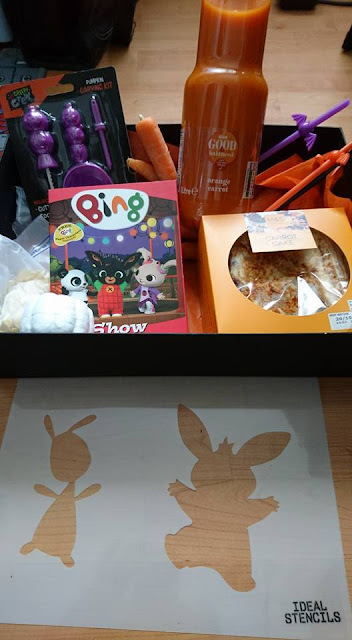 To celebrate this weeks launch of Bing:Show… And Other Episodes DVD, we were sent a Halloween-themed box of goodies to enjoy. I'm giving away 3 copies of the DVD so enter my competition! This DVD is the eighth and final volume in Season One, following Swing, Storytime, Paddling Pool, Fireworks, Surprise Machine, Music and Cat. The DVD comes with paper cut-outs of the characters where families can enjoy creating a scene, prefect for a night in this Halloween! You may remember a couple of years ago I made Halloween candles using napkins. I have also attempted to carve pumpkins and we love the dressing up and face painting we get to do! Peel carrots and cut a flat, nail-bed like surface at the tip. Using peanut butter, stick an almond flake on the tip to look like a fingernail. 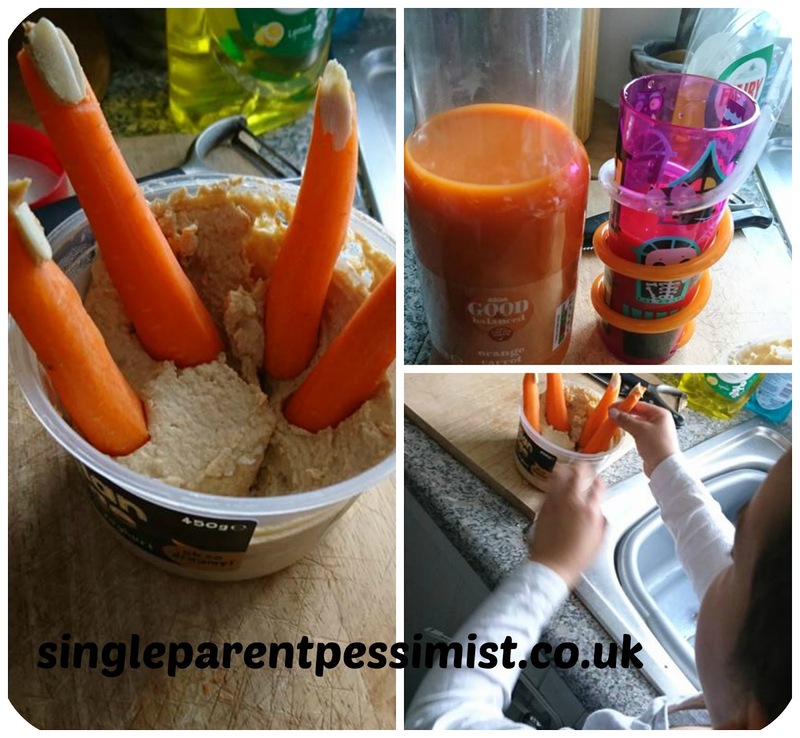 You can then stick them in dip (I used my homemade hummous) to look like a whole hand of fingers! We got some orange and carrot juice and put it into a Halloween plastic cup nanny found at a supermarket. We then added a Halloween-themed straw. The orange colour makes it look like a pumpkin cocktail, but you could use other squashes such as lime or a green smoothie to give it a slimey look. Bake a simple spongecake, or carrot cake if you want to make it a Bing Halloween cake. 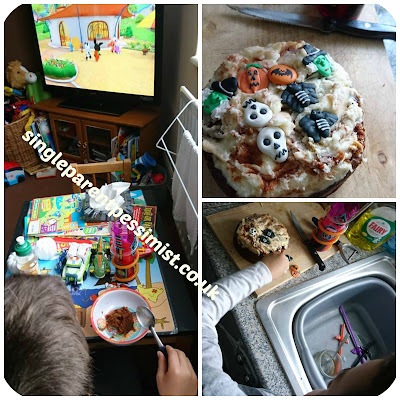 We then added some Halloween-style icing cake toppers. You could be even more creative and use food colouring to make a more gruesome looking cake. We got a couple of tiny, foam pumpkin shapes so Chunk could decorate them with paint, glitter and anything else we had in our craft drawers. We are going to get a real pumpkin soon and try the Bing and Flop stencils so watch this space! If you have any other Halloween ideas, please put them in the comments below! We were sent the craft pack to test for the purpose of this review. No payment was made, and all opinions are honest and my own.